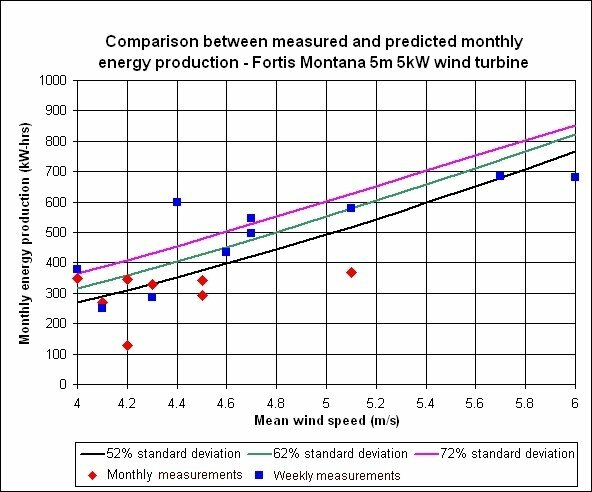 Small wind turbine field tests and comparisons with predicted energy outputs - Skystream, Fortis Montana, Turby VAWT. 6. 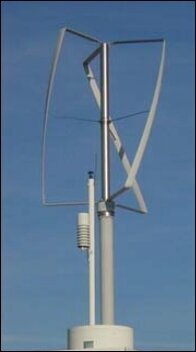 Comparison with field data for small wind turbines. Skystream, Fortis Montana and the Turby VAWT. Considering the large number of small turbines that have been installed, there is a surprising lack of information about how they perform in the field. However, there is a Dutch report on tests on thirteen small turbines carried out in Zeeland - a very flat river delta area in the westernmost part of Holland. Generally, the turbines performed badly with poor reliability and the three examples used here represent the spectrum of performance ranging from good in the case of the Skystream to poor in the case of the Turby VAWT. The test site was not particularly windy with mean wind speeds over a week or month of less than 5 metres/second. The results discussed below demonstrate again the importance of proper certification trials for a turbine so that a potential customer can have confidence in the performance claims. For the USA, the list of turbines that have received the Small Wind Certification Council approval can be found on the website www.smallwindcertification.org. For the UK, those turbines that have received accrediation are listed on the Microgeneration Certificate Scheme website - MCS accredited wind turbines. This widely-used US turbine has already been discussed on the previous web page. It has been the subject of a number of certification tests and so its power curve can be regarded as accurate. It is therefore not surprising that the monthly annual energy production figures are in reasonable agreement with the figures calculated from the WindPower program. 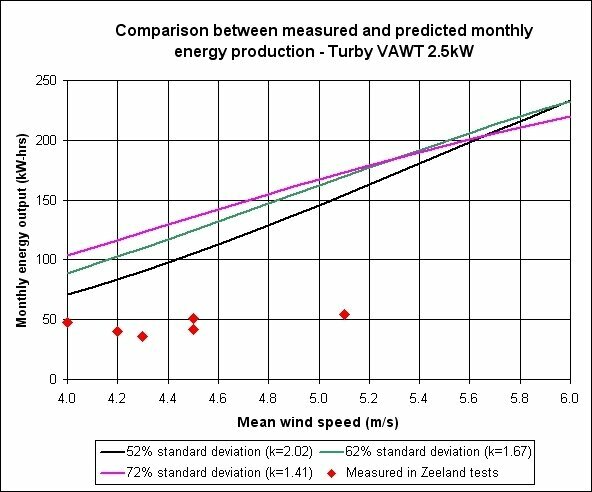 The figure below shows the field test results compared with the predicted monthly output calculated for a number of different wind speed standard deviations (or, equivalently, different values of the Weibull k parameter). 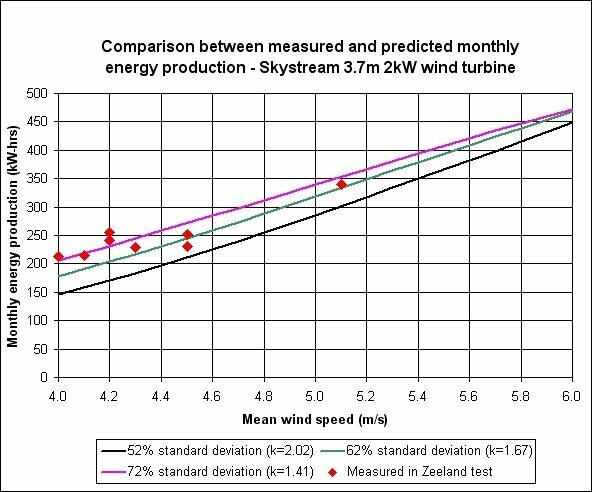 There will be some variation in the unsteadiness of the wind from month to month and the scatter in the Skystream output is consistent with the variation in the calculated outputs for different wind speed standard deviations. The turbine appears to have operated over the three year period without any reliability issues. The Fortis Montana is a Dutch three-bladed wind turbine with a tail fin. It was the largest wind turbine tested with a rotor diameter of 5 metres and a rated output of 5 kilowatts. Over a three year period, it was out of operation on four occasions ranging from a few days to four weeks. The figure below shows the power curve obtained from a manufacturer's graph. There is no mention of certification tests on their website (at February 2012) but the power curve and its associated efficiency curve are unremarkable with efficiencies that are quite plausible for a turbine of this type and size. The mean power curve on the right is calculated for a wind speed standard deviation of 52% - the Rayleigh distribution. The figure below shows the monthly energy outputs from the Zeeland test and also figures obtained from the manufacturer's website for weekly average energy outputs obtained from the same test series. The weekly figures have been scaled up by four to be comparable to the monthly figures. The scatter in the data is much more than can be accounted for on the basis of changes in the standard deviation of the wind over the averaging period. Data from those periods when the turbine was out of action have been excluded so it is not clear why there is so much scatter in the data. The field data is on average somewhat below the predicted energy outputs but not absurdly so. 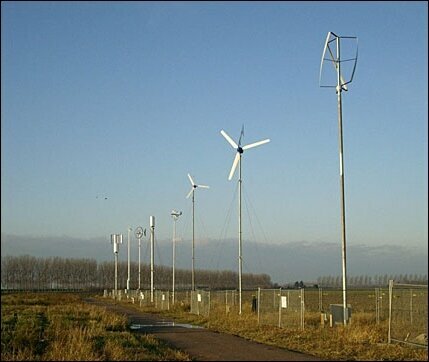 The Turby is another Dutch designed wind turbine whose details can be obtained from the website http://www.turby.nl/99-downloads/Turby-EN-Application-V3.0.pdf . 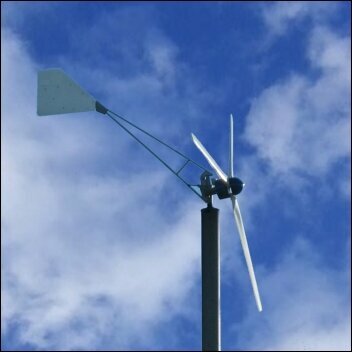 It is a vertical axis wind turbine (VAWT) and, like many of these designs, it is not self-starting but uses the generator operating as a motor to start the turbine rotating when the wind speed reaches some minimum level -about 3.5 metres/second. The power curve below was taken from a manufacturer's leaflet and does not appear to have been the subject of any independent validation tests. The curve on the right shows the mean power output based on the standard Rayleigh wind speed distribution. The efficiency curve is suspiciously flat and not very plausible. In the tests, the Turby was out of operation for about six months due most probably to a failure of the start-up mechanism. The results shown below are for those months when the Turby was fully operational and they show that the output was well below that expected from the manufacturer's power curve. This is almost certainly due to the manufacturer's power curve being 'optimistic'. Although much is made of the omni-directional response of VAWTs to changes in wind direction, they generally perform badly when compared with a well-designed HAWT of similar cost.